There was a very good historical survey in the ‘Scots Athlete’ magazine for October/November 1947 (Vol2, Nos 7 and 8) by the then club president DA Jamieson. It is reproduced here. Fifty years ago! Such a short span seems this period in historical retrospect, et what a stretch of endless vista it presents when viewed through youthful eyes. Many notable happenings, alike of historical, social and sporting interest could be chronicled of the year 1897. In that year Queen Victoria celebrated the Diamond Jubilee of her lengthy reign; Joe Chamberlain as Colonial Sectretary of a Salisbury administration occupied an up-stage centre position of the then political scene; Dan Leno, the famous music hall comedian, was still rocking his audiences to hysterical laughter with his quips and drolleries. In the world of sport, Bob Fitzsimons, the red-polled Cornishman, was sitting on the Heavy-Weight Boxing World’s champion throne; Alfred R Downer was the acknowledged Professional World’s Sprint Champion; and in the sphere of amateur athletics, Scotland was once again a united nation after being rent in twain by a domestic quarrel which had lasted for two years. Yet a further item – albeit of minor interest – must be recorded, for into the hosehold of the Scottish Amateur Athletic Association in this year of grace, was born another lusty infant – the Edinburgh Southern Harriers. So much then by way of prologue. To digress for a moment it is interesting to observe in this decision the pursuance in the practice of nomenclature by the Harrier Clubs of Edinburgh. Thus the parent club: “Edinburgh Harriers” 1886; “Edinburgh Northern Harriers” 1889; “Edinburgh Southern Harriers” 1897; and “Edinburgh Eastern Harriers” 1934 – originally “The Canon Athletic Club” 1922. Flourishing in the south-east area of the city during the 1890’s and exercising a beneficent influence upon the youth of its membership was a Bible-Class conducted by a well-known businessman in the city – Mr Alexander Tod. Here tribute must be paid to the memory of a truly noble-minded and public-spirited gentleman, to whose teaching and guidance many of his scholars owed so much. It was under such favourable circumstances, then, that the Edinburgh Southern Harriers found its genesis;and it was to a suggestion from the elder lads of his class to found a recreation club that Mr Tod lent a sympathetic ear and generous hand. On the walls of the club rooms at the present day a portrait of the late Alexander Tod occupies a well-deserved place of honour. 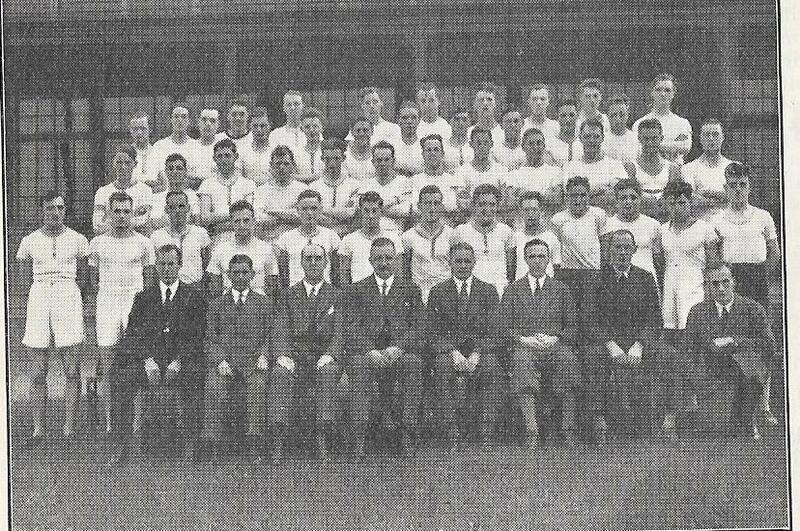 The early years of the club were uneventful and marked a period of ideal co-operation among its members. This excellent spirit still prevails, and the Club’s original motto of “Each for All, and All for Each” has borne much fruit in its practical application. Memories of these early days, and of many exhilarating cross-country runs over the open country then fringing the City – now covered overwith a multitude of dwellings – crowd in upon one. The season’s activities began with an Opening Run of the combined Harrier clubs of Edinburgh – in which some 200 runners took part – at the Portobello Baths. Then followed Saturday afternoon rendezvous at such places as the Sheep-Heid Inn, Duddingston; Fair-a-Far, Davidson’s Mains, where Mother Rankine used to provide such wholesome fare with generous helpings of home-baked scones thickly spread with real butter, and oatcakes of most satisfying substance; McLaren’s Cafe, abutting upon the Musselburgh Race Course, the scene of many a hard-won victory in Club cross-country races and also in National events; and the Barnton Hotel, Barnton, which reference induces nostalgic reflections of the gargantuan ‘ham-and-egg’ teas which always awaited the hungry harrier after his energetic exercise through the neighbouring fields and country roads. It was not until 1907, however, that the ESH began to develop its athletic strength. 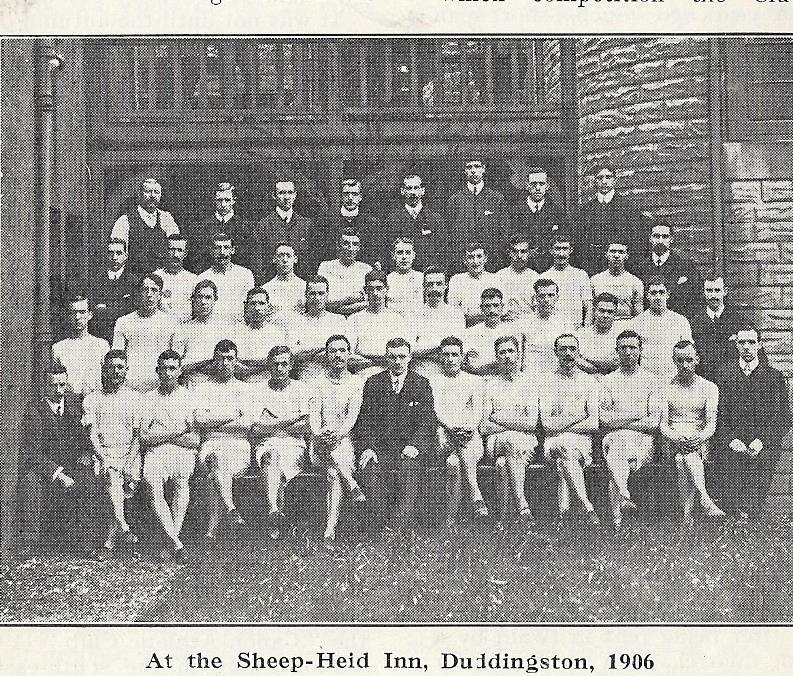 Minor successes had been gained in local events, and also a winning bracket in the Clydesdale Harriers Open Team Race (1904), in which competition the Club also figured as runners-up (1903 and 1906). The advent of Tom Jack and WAM Watson in 1901 inaugurated a new era in the Club’s history, and an initial success was scored in the Eastern District Cross-Country Championship in 1907. 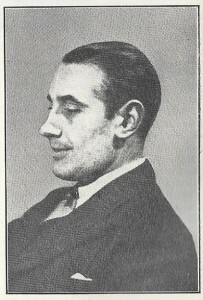 In this race the Club has been successful on five occasions (1907, 1920, 1927, 1930, 1936), whilst they had the honour of supplying the individual champion in 1938 in the person of Alex Archer. Other successes have been gained in the Eastern District Cross-Country Relay Championshipas winners in 1914, 1920, 1923 and 1924, whilst they were leaders in the seasons 1929-30 and 1937-38 in the Eastern District Cross-Country League. Although never attaining collectively to the heights of athletic greatness, the Club has, nevertheless produced many sterling athletes during its existence. To the present membership a long list of names would be meaningless, but there springs readily to one’s memory such athletes as Tom Jack, 10 Miles Flat champion in 1904, 1906-1910, 1912; 4 miles champion in 1908 and 1912;National Cross-Country title in 1907 and 1912; and the Olympic Games of 1908 in which he represented Great Britain in the Marathon race; WAM Watson, internationalist in 1903 in the Scotland v Ireland international; Sandy Thomson, George Pert, RJ Alexander ( a quarter-miler of championship class); George Lindsay, who represented Scotland in the old Scoto-Irish contests in 1911, 1912 and 1914 in the Putt and Hammer events; and the brothers Ramsay (GH and WA), distance runnerswell above the average. 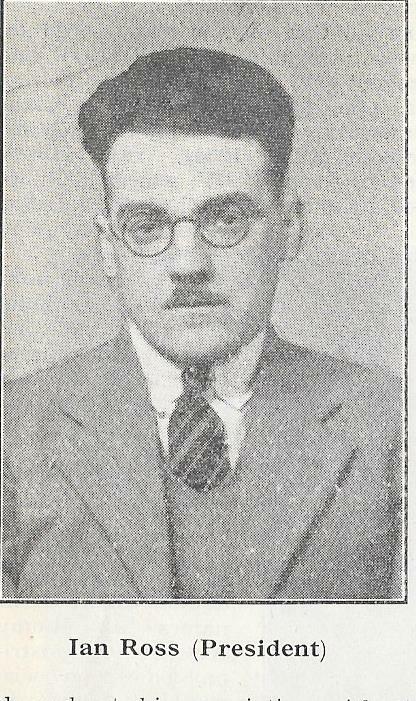 Again, in succeeding years came WD Patterson, an internationalist again in 1923 against Ireland, George Malcolm, who was ever the handicapper’s headache; AA Bowman, JA Henderson, R Paterson, GP Janieson and J Wilson(6 Miles SAAA title holder in 1934 and cross-country internationalist) who with others helped to maintain the prestige of the club in cross-cpountry and on the track. Of the present generation of ESH representatives, much could be written in praise of their merit. Sufficient to say that the Club banner has been gallantly borne J Smart, W Ferguson, JA Eddison, CJ Hall, W Fraser and others of promise, whilst the welcome addition of EQA Cofie to the membership of the Club has given to this speedy athlete many opportunities to form ties of friendship in a more congenial milieu. Pride of achievement may also be claimed by ESH members in other spheres of athletic activity. In Rugby Carl Ogilvie was capped for Scotland against England (1912) and Ireland 1911, 1912); Jimmy Gilbert has claimed similar distinction in the Association code as an Amateur against Ireland (1929, 1931), Wales (1931) and England (1931); whilst J Campbell held the Scottish ABA Light-weight championship in 1914. It is perhaps, however, on the administrative side that the Club has held a distinctive place in Scottish athletiuc history. In its own domestic affairs it has been well served by succeeding relays of whole-hearted and enthusiastic officials . Among past presidents figure the names of Jimmy Ross, whose histrionic powers on social occasions used to hold his audiences in thrall with renderings of narrative verse delivered with all the verve and action of the dramatic art; Matthew Dewar, one of the staunchest of club men, who had a deep-rooted contempt for the pot-hunter and the multiple-club athlete, and who would willingly have suffered the ordeal of the cruxifixion in maintenance of the first-claim rule. Matt in the course of his life long serviuces to amateur athletics, also occupied the Presidential Chair of the National Cross-Country Union ( 1914-1920); Dan Holland, ever zealous in the Club’s interests and still active in the administration of its affairs; Jimmy Gilbert, now bearing much heavier responsibilities as Hon. 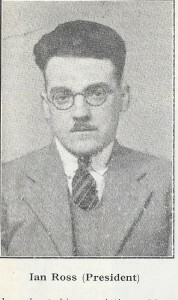 General Secretary of the SAAA in addition to representing his country on the British Amateur Athletic Board; and the ubiquitous Jimmy Henderson , a whole hearted worker and as keen as the Club’s youngest member. It has also been the writer’s privilege to serve as President and Secretary throughout his association with the Club. The office of President is held at present by Ian Ross who has served the ESH so well in cross-country and track racing, and is now exercising his Presidential duties for a second term of office with great acceptance. With him as his Vice-President is Alec Fraser, who is probably the greatestr ‘talent-spotter’ of all his contemporaries. It is interesting also to record that throughout the years of its existence three of the Club’s members have been elected to the Presidency of the SAAA. 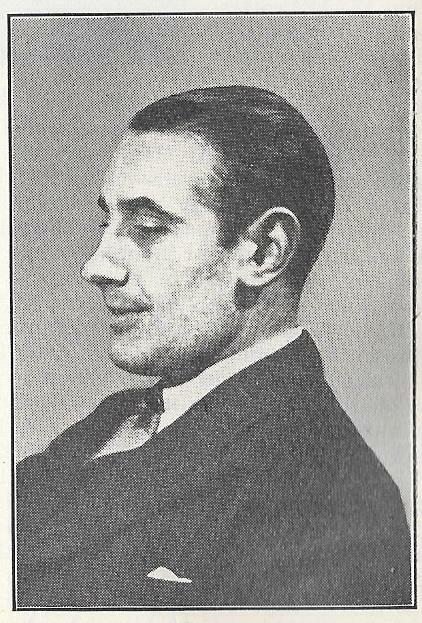 Namely, T Jack (1912-1913), J Gilbert 1932-1933) and DA Jamieson (1934-35). In the wider sphere of municipal administration, members of the ESH have also played a prominent part. Four of its number have served on the Town Council of the City of Edinburgh, all in their turn attaining to the dignity of the Magistracy. Moreover, the Club may claim to be pioneers of the present practice of enlisting the support of the Municipality in providing athletic entertainment for the citizens. It is largely due to the ESH activities that a public park in the City – the Meadows – was made available not only for sports meetings but for athletes to practise there. Meadowbank Park is also a present testimony to the public-spirited efforts of the ESH executive in securing the co-operation of prominent citizens and other sports organisations as long ago as 1923 in presenting a scheme for the conservation of what was then derelict ground into the present athletic stadium. In its Secretariat the Club has always enjoyed the benefit of competent officials , whose first principles in the discharge of their duties have always been loyalty and service either in times of adversity or success. In the exercise of these virtueshonouyrable mention must be made of Alec Bowman, who for over 20 years has has given faithful service as Club Secretary. “Steve” – as he is affectionately styled by club mates – has been one of the Club’s gilt-edged securities , and its firmly established position in present-day Scottish athletics is largely due to his sagacious management. At the outset of its existence, the Club occupied an excellent clubhouse nearby to the Meadows – already referred to – and here they were housed for nearly seventeen years. Circumstances, however, compelled removal to other quarters situated, fortunately, in the same vicinity. The close of the 1939-45 War found the members faced again with the problem of securing new premises. The acquisition of a new club house has been one of the Committee’s prime post-war achievements, and today the members enjoy the possession of a comfortable and convenient home in which to house and equip an ever growing membership. From the walls of this club room the images of its progenitors look down upon the scene with looks of mingled pleasure and pride. Yesm truly, they builded better than they knew. That’s where the article ends – maybe a bit long for the twenty first century but we need to at least try to understand those who did so much for the sport – and that includes understanding their manners and thought processes as well as looking at the content. The pride in the Club (always given a capital), its place in the community, its office bearers and the athletes shines through every word. It was more than a wee hobby.